Our CHILL (Communities Helping Improve Local Lives) team devised a plan to clean up an area behind the high school to deter drug activity, improve the walkway between NAPA Auto Parts and Burger King, and to beautify that area of the community. It has been an ongoing project to clean up and clear out the pathway between the high school and Burger King which has become known as an area that allows for illegal drug activity and risky behaviors. CHILL members along with Shannon Wray and Jeff Kenzie from Seven Oaks Landscaping Company worked several hours on Saturday, June 16th to finish the project. 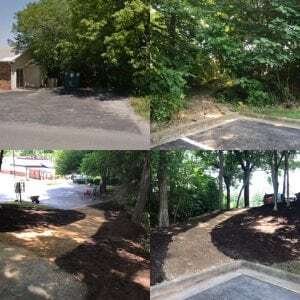 They cleared liter and debris in the area, cleared trees and undergrowth surrounding the path that was in place to open up the visibility, replaced the old path with a newer and safer path, and tremendously improved the visibility in that area.